Status: BCGS Cemetery Records updated October 18, 2008. 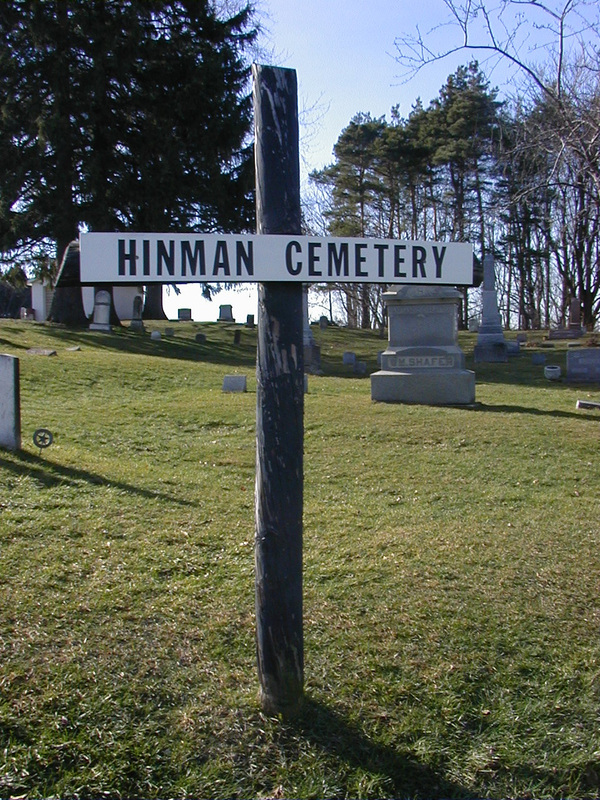 Hinman Cemetery was named after Adney Hinman who settled in Baroda in 1846. The cemetery is well maintained and is situated on a knoll. According to the “1880 History of Berrien County”, Hinman Cemetery was the first cemetery in Lake Township, which became Baroda Township in 1924. The cemetery was established in 1850 although, the earliest burials recorded by Mr. And Mrs. Victor Reisig in August of 1972 were those of Serena Hyatt who died in 1835 and Asenath Hyatt who died in 1836. The old section or northern section is slightly over 1 acre and the newest section is about 2 acres. In 1972, there were 1,000 burial sites which 465 were identified with markers. Approximately 150 sites are unmarked and 400 were empty lots. The cemetery has had few burials in recent years and the original plat maps for the old section cannot be found. Burial permits issued since 1935 can be found at the Baroda Township Hall. One of the most notable people interred within Hinman Cemetery is Frank Phiscator. Born in Baroda in 1862, he made his fortune in the gold fields of Alaska in 1896-1897. "The Klondike King" died on New Years Eve of 1905 in a hotel room in San Francisco, California. His throat was cut with a razor so it was debated if the official cause of death listed as suicide was correct or if he was murdered. Also interred within this cemetery are descendents of Godfrey and Rosana Beil/Boil/Boyl who are buried in Boyle Cemetery in Oronoko Township. They were early settlers of Berrien County in the 1830’s.